Some of you may have come across the Hashtag #IWishPeopleKnewThatDiabetes..... over the last year, which is the brainchild of Diabetesaliciouness blogger, Kelly Kunik. I met the superwoman herself last July at the MasterLab Diabetes Advocates conference. On that first morning, as I took a deep breath and joined a table of strangers. I know, I'm a very grown-up woman but I still have to force strongly encourage myself to do these things because I know I'll regret it if I don't. Anyway, I did not recognise anyone but as soon as the ladies started conversing and using their first names, I started to connect the "who" to the "blog" and figured out that the girl sitting right beside me was Kelly. Kelly has lived with type 1 since she was 8 years old (that's 38 years), and comes from a long line of direct relatives with type 1 diabetes, including her sister who died in 1991 from complications at the age of 33. Kelly gave an indept interview in August to Diabetes Mine in which you can read lots more about her and why she does what she does. The #IWishPeopleKnewThatDiabetes hashtag and the #IWishPeopleKnewThatDiabetes Day, (22nd April 2015), were inspired by 3rd grade teacher, Kyle Schwartz and her #Iwishmyteacherknewthat hashtag, which was heartbreaking. Kelly says that "This day is about people living with diabetes taking to twitter and using the hashtag in unison for a 24 hours period to express the good, the bad and the diabetesalicious of it all." The #hashtag and day took on a life of their own with over 16 countries participating and generating over 17 million twitter impressions to date. 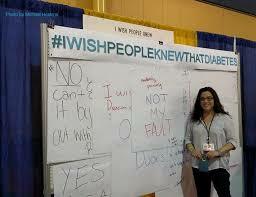 IWishPeopleKnewThatDiabetes.org is well worth a visit. Diabetes complications are real! Let's talk about it. What would happen to me if I had to face one of my biggest fears? I'm absolutely petrified of diabetes complications. I used to think that if I lost my sight and could not see my children anymore that it would be the last straw for me. I would imagine finding it very difficult to find a way to "power through". But meeting Kimberly Hislop taught me that I would probably face it like I do my diabetes-head on. I met Kimberly at the MasterLab Diabetes Advocacy conference in July, where she touched so many lives. She is a powerful advocate for diabetes and I'm sharing her guest post on SixUntilMe because her message should be shared. Diabetes complications are real. I think because soooo many people tell us about their relatives who've lost limbs to diabetes, that in an act of rebellion, we overcompensate with positivity. This makes people with complications feel like they're letting the side down. But the truth is, diabetes complications do happen, and we need to talk about them! Terrible photography! Myself & Kim. Thanks Kim for your bravery and starting the conversation! In July, I was in a hotel resort. In Diabetes World, surrounded by thousands of people with diabetes, and at the Friends for Life 2015 Diabetes Conference. I felt like I was in a dream! Those of you who have been following my blog for more than a year will know that I attended FFL UK last August and wrote about it for weeks. If you haven't seen those posts, here is the first one. Well, FFL US has given me enough material to write for months maybe even a year! What is Friends for Life (FFL)? The FFL conferences are organised by ChildrenwithDiabetes, an American non-profit organization dedicated to providing education and support to families living with type 1 diabetes. www.childrenwithdiabetes.com (CWD) was started by Jeff Hitchcock in 1995 in response to his daughter Marissa's diabetes diagnosis at the age of two. The idea was -- and continues to be -- to share experiences with other families, so that together, we can all make a difference in the lives of everyone living with type 1 diabetes. In August 1999, a diabetes Mom on the CWD email list, Laura Billetdeaux, was planning her family holiday in Orlando in June 2000. She sent out an email to her friends on CWD asking if anyone was interested in meeting up there? 550 people from across the US showed up! That was the first FFL! And FFL 2015 was their 66th conference to date. - There were over 2,000 families, attending FFL 2015! That number, in itself is impressive, but when you consider how many people make up family then it's mind blowing! Joe Solowiejczyk, who is coming to Thrive-abetes this October. Gary Scheiner, author of "Think like a Pancreas"
- It is huge. So big, some of the booths have play areas for the kids. - They have childcare facilities, all ages of children programmes, tween and teen programmes, so that ALL of the grown-ups can fully experience the presentations. They next FFL that might be of interest to folks is in London - however, this conference is sold out since last March. But if you were planning your 2016 family holiday in America then why consider making the FFL 2016 conference part of your holiday in July? It's MORE than worth it! I put together some of my photos from both of the conferences I attended in Orlando if you would like a better taste. The Friends for Life conference (FFL) was started by the Childrenwithdiabetes.com organisation in the United States where families could meet each other and have a vacation in Disneyland. Today, the FFLconference has evolved into a national mega-conference that 1,000 people with diabetes attend. It's open to ALL family members, including grandparents and now has programmes for the adults living with type 1 diabetes, as well as all the age groups of children and young people. They even have a FFL in the United Kingdom. You may remember last August when I blogged almost endlessly after I had been lucky enough to attend FFL UK with my friend Christine!!! The experience was fantastic and was where the seed of Thrive-abetes turned into a sapling. So when I saw a post on Facebook from the Diabetes Hands Foundation offering scholarships to attend FFL or FFL MasterLabs I was jealous. Then! I remembered that I was married to an American and that we have planned to visit his family in Minnesota this coming July. I was actually going to be in the US while the conference is taking place and there fore less expensive to sponsor. Guess what! Yep! I won a scholarship to the MasterLab advocacy conference which I have extended to include registration for FFL conference. 1st reason to be excited - I'm going to Orlando, Florida! I've never been before. No. 2 reason to be excited I'm going to FFL!!!!! No. 3 reason, well let me show you with this short video.